There’s a very useful keyboard shortcut that will let you jump straight to a word or phrase (or any sequence of letters or numbers1) in almost any document or file – it’s Ctrl+F2. If you’ve opened a 200 page PDF and want to find the word WIDGET then use Ctrl+F to bring up a ‘find’ search box and type in the word widget. Pressing ‘enter’ on the keyboard will let you bounce through each of instance of the word in the document. Depending on your set up some PDF readers will also let you see a panel with all instances of WIDGET in it, in the sentence, allowing you to see a bit of context and decide which one to look at first. Ctrl+F again. You can also change all instances of WIDGET into GADGET by using Ctrl+H (Shift + Command + H on a Mac) to bring up the Find & Replace option, type widget in the top box and gadget in the bottom (make a decision on upper or lower case matching) and press replace all to convert all widgets to gadgets. True story, I once did this in a spreadsheet of people’s names and addresses and converted all instances of UK into United Kingdom and then discovered someone’s first name had become LUnited Kingdome instead of Luke. Should have selected just the country column but I could also have avoided that by better case-matching. 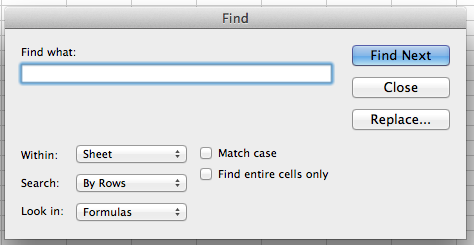 Within the sheet you’re on Ctrl+F will do the job but note the option on the search box (below) that appears which lets you pick whether to search within the current sheet or the whole workbook (ie find your word in a cell in a different tab). 1 you don’t even have to type the full word, just enough letters to pick out the word you want and exclude those you don’t, for example if searching for widget then ‘widge’ would probably do whereas ‘idget’ would also find ‘fidget’. 2 Ctrl+F = holding down the Control key while the letter F is pressed, for Find. On a Mac it’s the Command key instead of Control. You can also access Find in the Edit menu.